Beef sirloin steak doesn't require much gussying up. 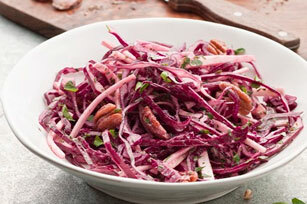 Still, we've found this pecan-studded red cabbage slaw to be a terrifically tasty accompaniment. Toss cabbage with onions in large bowl. Mix Miracle Whip, vinegar and sugar until blended. Add to cabbage mixture; mix lightly. Refrigerate until ready to use. Heat grill pan on medium heat. Meanwhile, sprinkle steak spice over both sides of steak; press into steak to secure. Spray hot grill pan with cooking spray. Add steak; cook 7 to 8 min. on each side or until medium doneness (160°F). Remove steak from grill pan; let stand 5 min. Meanwhile, add nuts to coleslaw; mix lightly. Cut steak across the grain into thin slices. Serve with coleslaw. Prepare using Miracle Whip Calorie-Wise Spread. Garnish with additional nuts before serving.